As a yoga teacher, yoga therapist, and yoga researcher, I have worked almost exclusively with arthritic populations for the past 15 years. The possible benefits of yoga for people with osteoarthritis and rheumatoid arthritis was even the topic of my doctoral dissertation (spoiler alert: it helps). In working with this population, I have learned a lot about how and why yoga can be useful for arthritis management, but I’ve also discovered a great deal about the challenges people with joint pain can face during hatha yoga practice. 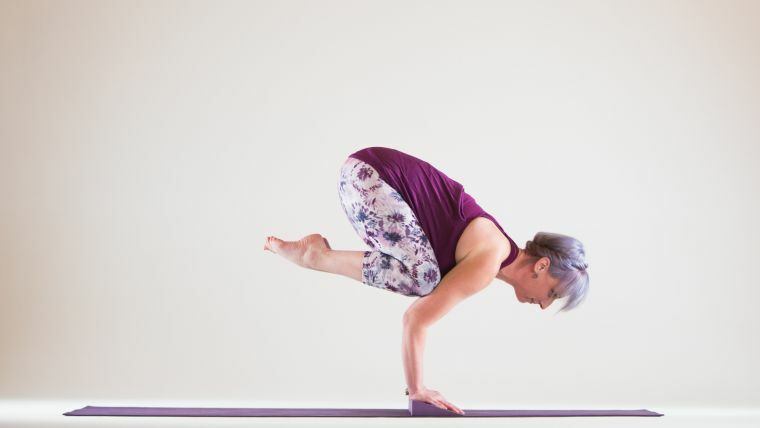 Through experience, I learned what my teacher training did not explicitly teach, and I can now easily modify any yoga pose to meet these challenges in dozens of ways, right on the spot. The process of adapting yoga poses for joint symptoms is not just a professional passion of mine—it also became a personal one. During my doctoral research, I became accustomed to modifying poses for arthritic knees. I didn’t realize that anything unusual was happening in my own knees until I participated in the control group for a knee arthritis study, and an MRI revealed that 20 years of dance and overtraining for marathons had resulted in meniscal damage. In fact, the technician reported that my menisci were “torn to shreds.” Remarkably, I had had no knee pain up to that point, though over the next several years I began to notice that sitting in lotus pose was painful (and even child’s pose was not very relaxing). Then I began to write my dissertation, and the wrist pain started. The process of adapting yoga poses for joint symptoms is not just a professional passion of mine—it also became a personal one. For those of you without direct or indirect experience with dissertation writing, it is a bit like a birth—involving many months of increasing discomfort and preoccupation with its gestation and development. The hours spent staring at a screen, with inadequate self-care and less-than-ideal posture, can take a toll. For me, the toll was on my right wrist. The longer I typed, the more it hurt. I could get some relief by supporting it, but I still needed to take breaks to rub and ice it, and eventually had to wear a brace. I thought at first that I might have carpal tunnel syndrome, but then realized that the pain occurred with wrist extension—not flexion, as in carpal tunnel syndrome. Eventually, I was diagnosed with a ganglion cyst. I could opt to have surgery, but the surgery offered only a 50 percent chance that the cyst (and the pain) would not return. I now consider this cyst to be a battle scar from my rigorous scholarship—one that has forever affected my yoga practice and helped me to better relate to my research participants. While my wrist pain is nothing like the symptom severity that arthritis patients often experience, it has helped me to realize how many yoga poses rely on wrist extension, often coupled with some serious weight bearing. These particular weight-bearing poses are actually one of the reasons that yoga is great for building upper body strength, which is often lacking in women and generally underutilized by all of us in our daily activities. We don’t want to miss out on these yoga poses due to wrist pain. At the same time, we want to practice self-care and avoid exacerbating our pain when we practice. While wrist pain can require special considerations and modifications in many poses, it need not be a barrier to yoga practice. If you have wrist pain or you are a yoga teacher who has students with wrist pain, here are some helpful ways to modify common asanas. While these poses have less weight-bearing in the wrists than some other asanas, they are incredibly common, even in gentle, beginner, senior, and therapeutic yoga classes. 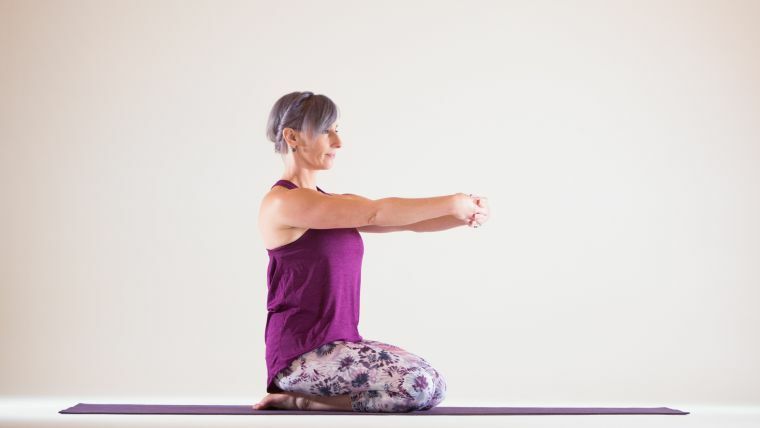 It is not uncommon to stay kneeling on hands and knees in these postures for quite a while, especially if you practice variations with limbs extended or while “threading the needle.” Fortunately, there are many simple modifications that can reduce or eliminate wrist pain in this position. 1. 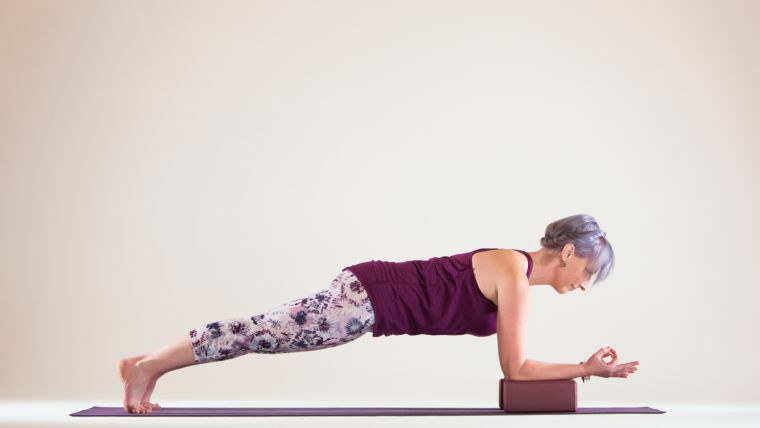 Support your wrists with a fold of your mat. Some people fold or roll the front of the mat to create a bit of additional cushioning. They place the wrist at the end of the rolled portion, so that the end of the hand and fingers are off the mat and on the floor in front of them, decreasing the wrist angle somewhat. However, I have found that the elevation does not sufficiently decrease the angle for me, and my wrists tend to sink into the folded portion of the mat. 2. Support your weight on your fists instead of your palms. Whenever we use weight-bearing through a joint, we engage the small stabilizing muscles that support the joint. So this modification can actually help to strengthen the muscles surrounding the wrist joints, as long as the wrist is stable and sufficiently well-aligned to support it. When using fists, face the palms inward, keeping the shoulders integrated and avoiding locked elbows. The state of the thumb joints will often dictate their orientation. If the thumbs are extended, be sure to avoid pressing excess weight into the thumbs. If they are folded in, avoid placing them inside the palm or pushing the knuckles into the thumb. 4. Support your weight on your forearms instead of your palms. Most people will want to place the forearms on blocks or some other support, depending on limb length and proportions. Be sure the block height is stable and allows for a long spine. It is not critical that the spine be perfectly horizontal, as long as all joints are safe and comfortable and the spine is well-aligned. 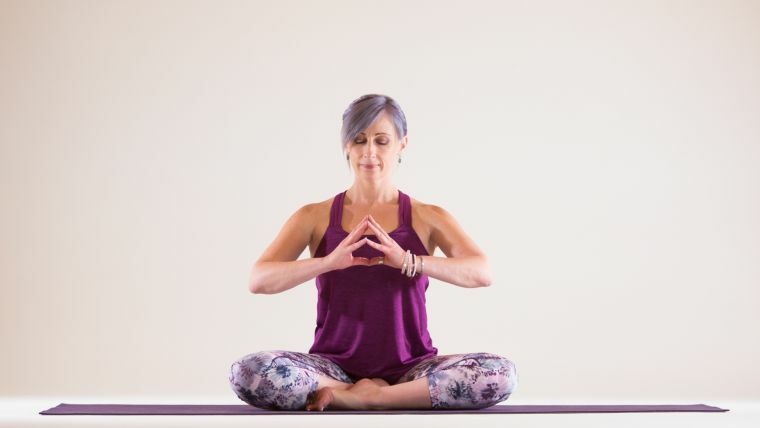 In this position, anything can be done with the hands—including keeping the palms spread wide, holding the block, or even implementing a mudra of your choosing. While reverse table is generally done with fingers pointing toward the body, it can be done with fingers pointed away. Some people will find that this is more comfortable and sustainable for the wrists. A wedge can be added beneath the hands to support the wrists in either orientation. 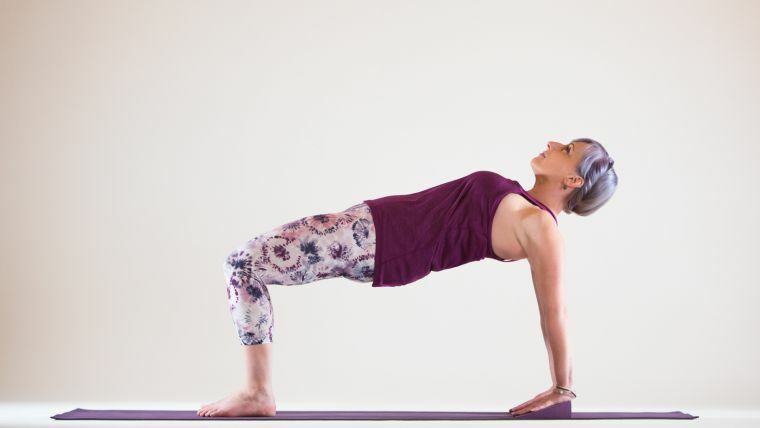 Lowering to forearms can also work for a reverse plank but usually doesn’t allow lifting the body high enough if the knees are bent in reverse table. Another way to reduce wrist extension in both of these poses is to place the hands on the arms of a chair. If the chair doesn’t have arms, you can hold onto the sides of the seat. 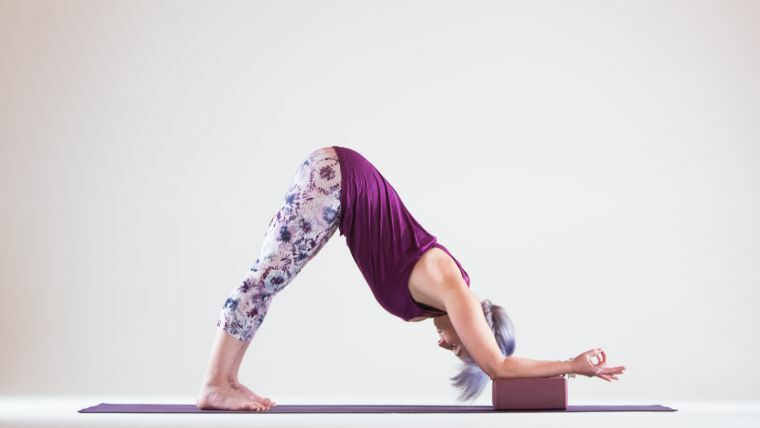 If you're practicing downward dog with forearms on blocks, be sure that the pose is stable and that blocks are used at their lowest orientation to avoid toppling over. A chair or wall can be used for downward dog also. 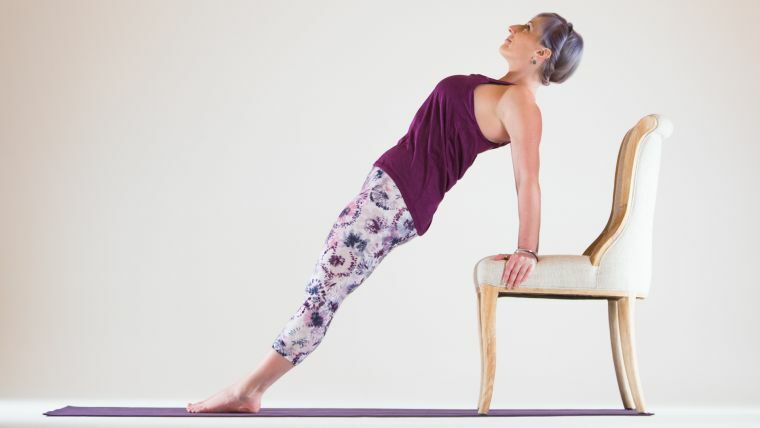 For a deeper downward dog, place your hands on the chair seat instead of the chair back. 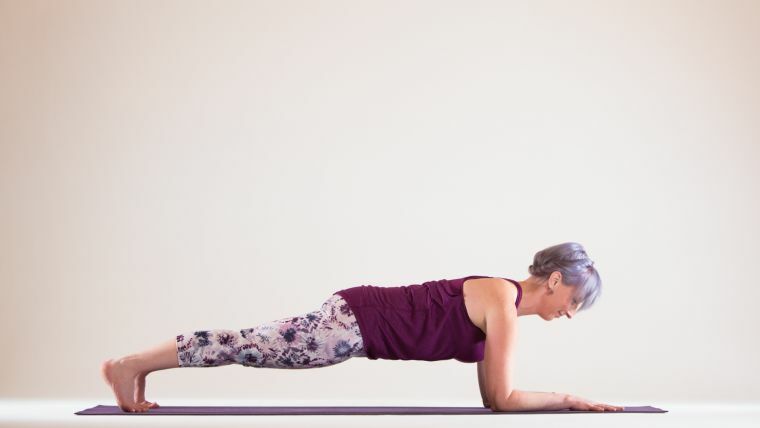 Plank pose puts a lot more pressure on the wrist joints than table does because it increases the angle of wrist extension. And because the arms may be bearing more weight if one does not have a lot of core strength to support the pose, this pose can excessively compress the wrist joints. The amount of weight on the wrists can be reduced by lowering the knees to the floor so that some of the body weight is supported by the knees. 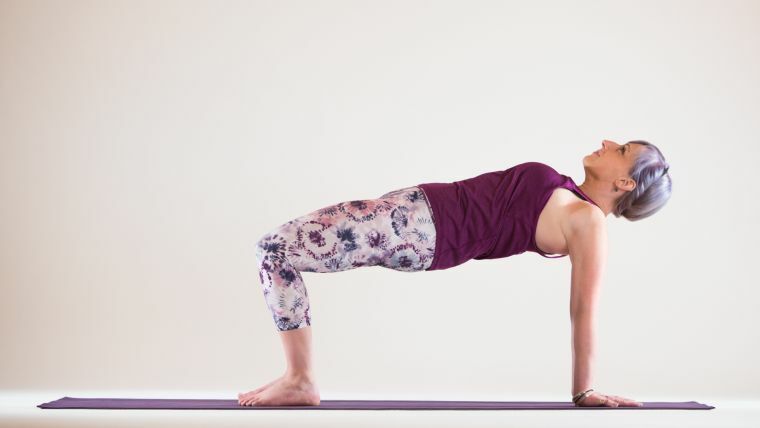 As in table, placing the forearms either on blocks or on the floor can also work in plank, and indeed the latter is a common variation on the pose. For mild wrist challenges, using a wedge might be sufficient. A variation on plank can also be done at the wall or with forearms on a chair. Just be sure that the chair is stable and won’t slide out from under the pose. I will admit that I almost never do crow pose anymore. I decided that my compulsion to execute crow despite my wrist pain was mostly about ego and grasping, and thus it was not in alignment with yoga philosophy. That being said, I did recently try it using my fists. It was much more difficult (as my base of support was much smaller than if I were balancing on my palms)—but it was certainly possible, and it was not painful. Because it involves bearing so much weight (that of the whole body) and extreme wrist extension, even the wedge is not sufficient propping for me. Other yogis, however, are able to use the wedge or other cushioning with success. I don’t recommend handstand if you have wrist pain because, like crow, it places the entire body weight on the wrists—and this is not a pose one can safely modify by using props under the wrists. Fortunately, there are a lot of full inversions that don’t stress the wrist joints. I love to use a forearm balance or headstand pose, and shoulderstand doesn’t exacerbate my wrist pain either. When introducing mudras, I am very aware of possible joint stress. For some people, bringing palms together in prayer position is too much wrist extension. In that case, I encourage touching the fingertips and feeling the energy between the palms. Some people make a fist with one hand and hold onto it with the other hand, or place the palms on the heart center. When practicing any yoga pose, or even just going about our daily routine, we have an opportunity to choose between compression and elongation. Are you slouching right now? If so, that means that your spine is compressed and gravity is putting pressure on your intervertebral discs. When you elongate the spine, however, you are using core muscles to create space between the vertebrae and to therefore reduce disc compression. The same is true in any joint, including the wrists. While choosing space rather than compression might not in itself be sufficient to relieve joint pain for those with a wrist challenge, adding that to the modifications above can certainly be helpful. 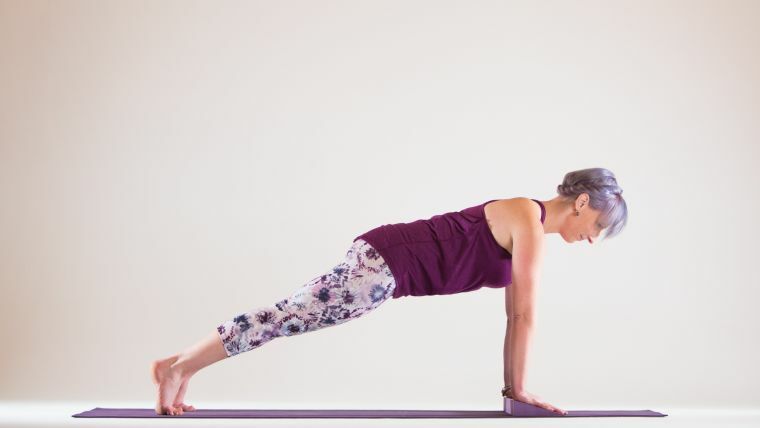 When in downward dog, are you dropping weight into the wrists, or are you engaging the surrounding musculature to create more space in the joint? Remembering to create that space can also help to prevent wrist pain or exacerbation of wrist pain. Another way to avoid dropping as much weight into the wrists is to make sure your weight is evenly distributed around the full surface of the hand, including all four corners of the palm, fingers, fingertips, and thumb. The more surface area that is taking your weight, the less pressure is brought to bear on any one part of the body—including the wrists. Making yoga accessible to anyone regardless of their physical limitations means finding modifications that work for everyone, thereby ensuring that no one feels "less than" because of their limitations. Yoga is not just a physical practice. It’s a way of being in the world that involves unification of the mind with the body, and adherence to ethical principles. Honoring those principles by making yoga accessible to anyone regardless of their physical limitations means finding modifications that work for everyone, thereby ensuring that no one feels “less than” because of their limitations. This is partly the responsibility of the yoga teacher. However, it is also part of each individual’s practice to accept responsibility for grappling with attachment to practicing in a particular way. As we make choices about our asana practice, we should apply the principles of non-harming (ahimsa), non-grasping (aparigraha), and contentment (santosha). If an action increases joint pain, do something different: ahimsa. If you need to avoid or modify a pose, be okay with that: aparigraha. Whatever my wrists can or cannot do today, I’m cool with that: santosha. Ultimately, you follow the dictum to find contentment in the moment, whatever it brings. 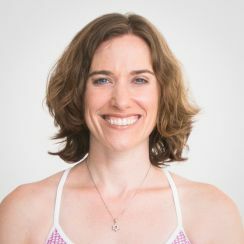 My limited experience with joint pain has brought the workings of my mind to the surface, helping me to examine closely my choices in asana practice and in life. Whatever is happening in your wrists, be sure to stay safe by being kind to your body. Whatever is happening in your mind, thank your wrists for the opportunity to explore those feelings and insights.